See beautiful horses and have an unique experience. There is nothing like this in the Eastern United States. It is only one hour away from Arbor House of Black Mountain. You can spend your second day in Asheville or at the Biltmore or just enjoy the lake and mountain views from our Bed and Breakfast. The FEI World Equestrian Game 2018 will be held at the Tryon International Equestrian Center in North Carolina (USA) from 10 to 23 September 2018. Testing for the equestrian game happens in April. This is the Olympics of Horsemanship. It’s a spectacular venue and with eight disciplines. The Tryon International Equestrian Center, created by Mark Bellissimo in Mill Spring, North Carolina showcasing some of the top riders in the Hunter/Jumper, Dressage, and Event disciplines. It is situated on a 1,600 acre site at the foothills of the Blue Mountains. 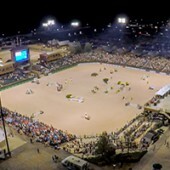 The venue has 1,200 permanent stables, 12 arenas including a floodlit international arena with a potential spectator seating capacity of up to 12,000 and VIP seating for up to 1,500, a covered arena with 5,000 seats, and has a world-class cross country course that will be used for both Eventing and Driving. The venue is surrounded by hundreds of miles of equestrian trails for Endurance. The FEI World Equestrian Games, held every four years in the middle of the Olympic cycle, is one of the biggest events on the global sporting calendar, combining eight World Championships at one event. The FEI disciplines – Jumping, Dressage and Para-Equestrian Dressage, Eventing, Driving, Endurance, Vaulting and Reining – are all included on the competition schedule. Tryon International Equestrian Center hosts hunter/jumper horse shows in the spring, summer and fall. TIEC also hosts dressage horse shows as well as eventing horse shows. For specific show dates, please click here for the list of upcoming events. If you’ve never been to a horse show before, go to their Horse Show 101 page to learn about the competions. Admission to all of our horse shows and events is free and no tickets are required. We hope you’ll bring the whole family or a car full of friends! Our special Saturday Night Lights Grand Prix show jumping events are also free – carousel rides, music and live entertainment included! For more information on Saturday Night Lights,click here. TIEC is located conveniently off of exit 170 on US Highway 74, at 25 International Blvd, Mill Spring, NC 28756. Saturday Night Lights is a Grand Prix equestrian event featuring food, fun, live music, and the highest level of competitive show jumping at Tryon International Equestrian Center on select Saturday evenings throughout the year. Bring the whole family: admission, parking and carousel rides are all free!